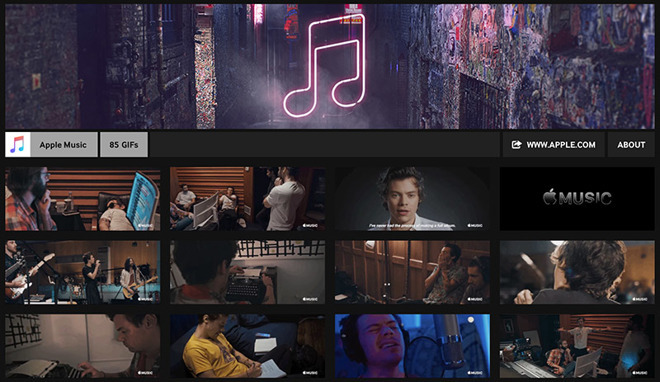 In its latest attempt at social media marketing, Apple recently invited followers of its Apple Music Twitter account to view and share custom made GIFs of exclusive content like the upcoming Harry Styles documentary. In a tweet on Wednesday, Apple posted an animated GIF taken from "Harry Styles: Behind the Album," a documentary slated for release as an Apple Music exclusive on May 15. Accompanying text points to an official Apple Music Giphy account, suggesting the company plans to employ the free to use service in future campaigns. Apple has in the past used GIFs to market streaming content, most recently tweeting out a plug for NBC's "The Voice" on May 8, but the Giphy account is new. Prior to today's post, Apple relied largely on short video snippets hosted by its own servers and embedded into tweets. As of this writing, the Apple Music Giphy page features 85 GIFs generated from original and exclusive content. Joining animations from the Styles documentary are GIFs from Taylor Swift's 1989 World Tour concert video, music videos from Kendrick Lamar and Gucci Mane, and Apple Music commercials starring Swift and Drake. A popular online database of animated GIFs, Giphy allows users to search for, create and upload content for sharing via messaging services and across social media sites. The website also breaks down GIFs by category for browsing. In addition to a main web interface, Giphy markets a number of iOS apps, including a flagship title that leverages the iOS 10 Messages API to allow iPhone and iPad users to send GIFs or animated stickers directly from their keyboard. Similar functionality is provided in the standalone Giphy Keys app, while Giphy Cam lets users create GIFs using an iOS device's camera. A separate app called Giphy Stickers enables the creation of stickers for use with Messages. The launch of Apple's Giphy channel follows a related effort to capitalize on social media platforms with the recently launched Clips app for iOS. Released in April, Clips offers users an Apple-designed alternative to social media creation tools made popular by companies like Snap and Instagram. The first-party title boasts a range of tools and powerful editing features that allow users to stitch together content of up to 60 minutes in length.